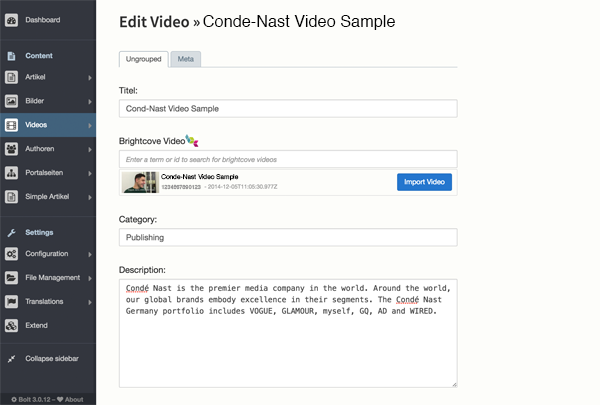 A special field type that stores a reference to a Brightcove video and can copy connected meta properties of the video from Brightcove to other configurable fields. This extension also imports the video thumbnail and provides a template for the default Brightcove player. Bolt Extension to upload multiple Files (Images) with meta-informations. This extension uses a configured contenttype for your images and created/updates these objects and stors a list of ids as a json string in the field. This extension adds a new field type to bolt that can be used to store images and their attributes. The images can be stored either inside a local contenttype or inside cloud storages or CDNs like Cloudinary. Provides a backend field where you can select one or more other content objects from different contenttypes. The field is similar to bolt's select field but can select more than one contenttype at the same time and provides a better preview.